Holiday Accommodation - Self catering cottages, Holiday homes and apartments in Churchill and Letterkenny. Letterkenny Self Catering - Welcome to our website designed with you in mind. Amongst our range of self catering apartments, townhouses and cottages you will find all the information you will need to make your stay in Letterkenny, Donegal all that you could wish for. 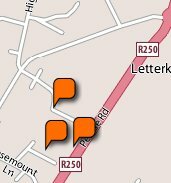 Interactive maps will take you to local attractions in and around Letterkenny, Churchill, Donegal and the North West of Ireland. Just click on any of the images above to start your search for the perfect self catering accommodation to suit you, or alternatively click on any of the buttons adjacent to start browsing the website. 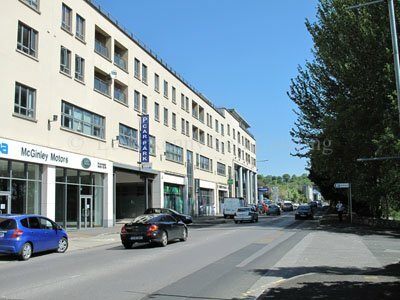 All our letterkenny self catering apartments and townhouses are conveniently located in the heart of Letterkenny within walking distance of four shopping centres, theatre and cinema and all the culture and nightlife which makes the town such a delight, we leave you to take full advantage of all Letterkenny has to offer. Even by Irish standards, Letterkenny is well provided with lively pubs, many of them offering Irish music. 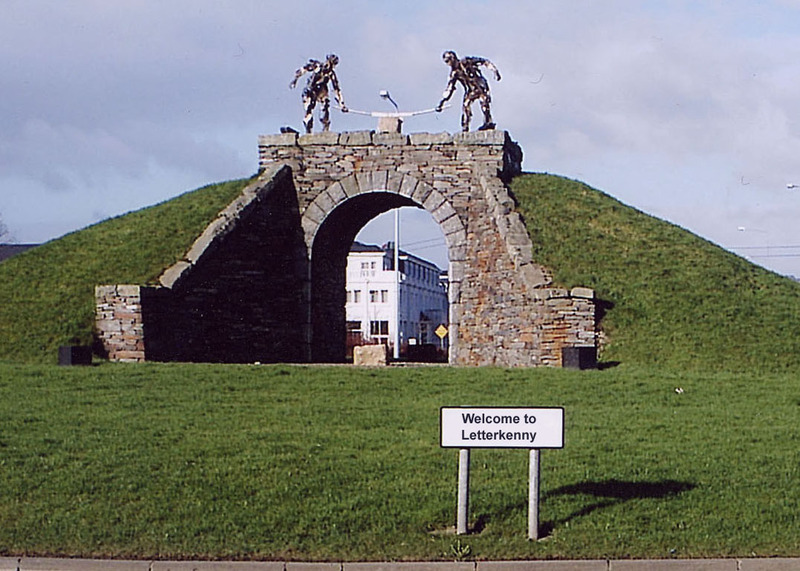 Letterkenny got its name from the Gaelic Irish "Leitir Ceannain" meaning "Hillside of the O'Cannons. Letterkenny had grown into a prosperous market town by the 17th century and is now the largest and most densely populated town in Donegal. The O'Canainn clan were the earlist recorded overlords of the Swilly-side. They were first mentioned in history in 948 and their last cheiftain Rory O'Canainn, was slain in 1248 to be succeeded by Godfrey O'Donnell as king or Ri of Tir Conaill. However it was not recognised as a town until the Plantation of Ulster when the Fair-headed hillside was granted to a scotsman named Patrick Crawford along with one thousand acres of land between 1610 and 1611. He was killed at the Seige of Dunyvegan in Isla, Scotland and sir George Maybury married his widow. Sir George built a plantation, a market town called Letterkenny which consisted of fifty thatched houses thirteen of which had clay and stone walls. The main streets were more pony tracks than streets. Letterkenny Co Donegal’s largest town originated as a tiny fishing village on the banks of Lough Swilly. A vibrant growing town, Letterkenny makes an ideal North West region touring base due to its central location, warm relaxed ambience, friendly out going people and wealth of heritage sites, outdoor and indoor activities, crafts culture and entertainment. Since it's launch in 1972, Letterkenny is also home to the Donegal Internationally Rally. This annual sporting event, organised by The Donegal Motor Club in the early 1970’s, was originally called the Circuit of Donegal Internationally Rally. 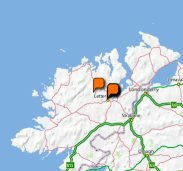 The Rally covered the whole of Co. Donegal during this time. Today the rally stages covers approximately 300 kilometres of adventurous world famous stages through some of the most breath taking scenery Donegal has too offer. Downings Atlantic Drive, Glen, Knockalla, Fanad Head Muckish, Cashenagor, Dungloe Lake, Doochary, Trentagh, Gweebarra, Rosbeg, and Lough Eske to name but a few. The Donegal Internationally Rally attracts approximately 50,000 spectators each year which takes place over three days in June. The rally attracts some of the great Irish, British and World famous drivers and teams to compete over the years. Churchill village is located 8 miles west from Letterkenny, the largest town in Co.Donegal. An Ideal place to stay whilst visiting some of Donegal's most renowned attractions. Nestled beautifully into Donegal's rugged landscape the picturesque Mountain Lodge cottage is located on an elevated site and enjoys breathtaking views over the Donegal countryside. Churchill village is only 1 minute walk away and you can enjoy the craic in the local pubs. As The Mountain lodge is centrally located within Donegal, you're within easy traveling distance of the major tourist attractions such as Glenveagh National Park, Gartan outdoor education centre and the historic site of St Colmcille's birth.